In order to start using BrandChamp with Shopify, you must authorize the BrandChamp Shopify app for use with your Shopify store. You will need to have admin credentials for your Shopify store to complete this section. To authorize, go to the Integrations tab under the Settings page. Your Shopify store will have it's own address at the myshopify.com domain. Enter just the store name part in the input box here. E.g. if your store's address was my-shop.myshopify.com, then you need to enter "my-shop". You can review and edit the settings as described below now or come back and edit later. This shows the website your customers will actually use, as read from Shopify, rather than your myshopify.com one. For example, it should point to yourshop.com, and not yourshop.myshopify.com. This is the currency as read from your Shopify store. The expiry, in days, for any Shopify Discounts issued as a BrandChamp reward. The expiry, in days, for any Shopify Gift Cards issued as a BrandChamp reward. If using Shopify referral links, this is the number of days a referral cookie will be active for. 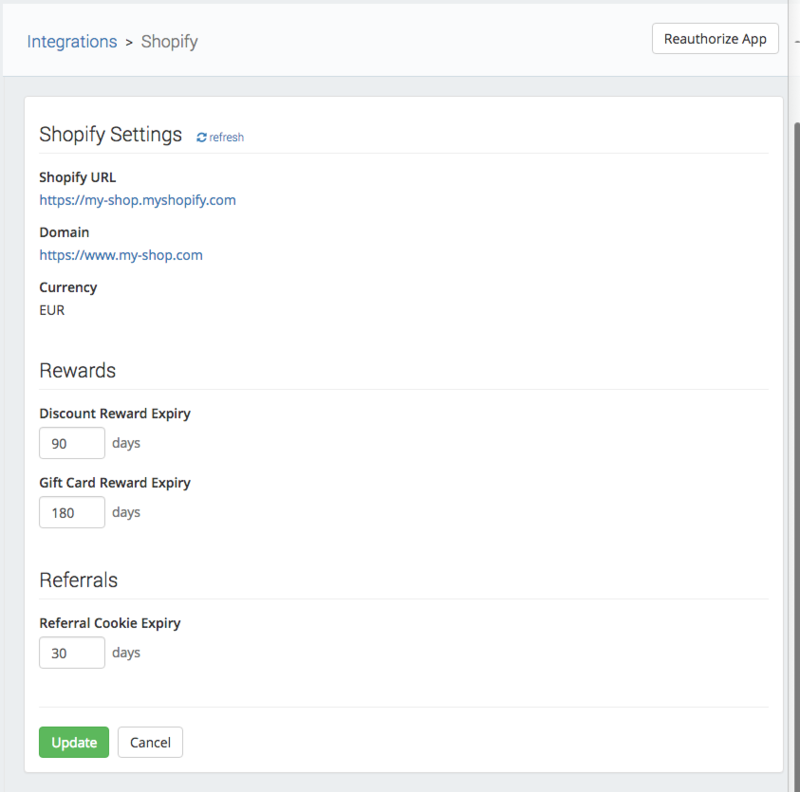 Once you've authorized the BrandChamp Shopify app, you can configure the Shopify Website Integration.